The Stoppable Force has a good post for new [tag-tec]Death Knights[/tag-tec]. First on he admits to only being level 63, but by listening to what others are saying saying and doing he’s realized that he has some good stuff to offer. His posts covers attack rotations for each tree (blood, frost, unholy) and why you want to use them. Good stuff. Some good stuff in the comments, too. Something that will be a great help in building an attack rotation, for your DK or for any character, is your keybindings. Don’t click your powers, bind them to hot keys. All other things being equal a key-binder will always outplay a clicker, because the bindings are so much faster to use. Here’s a nice tutorial on the How and Why of keybindings, by LockSucks.com. While it’s a Warlock post I think most people will be able to use the info and adapt it to their Death Knights or any other class. Frost isn’t just for tanking. This wag has been doing just fine by going against convention and using a Frost Build for his Death Knight. A great overview of the Death Knight, what it’s like to play, and so on. There be some changes comin’… Here’s what’s currently on the test server, scroll down to see the list of possible DK changes. Of course, since it’s on the test server any given change may or may not make it to the live servers. 3.0.8 PTR Patch Notes Now Available | DeathKnight.info – PTR Patch notes where released today so I would expect to see them hit the PTR just about any time now. 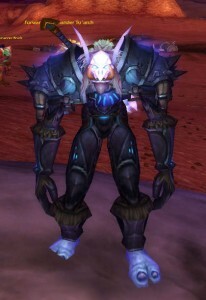 One thing to note, you can now create Death Knight on any server once you hit 55! Death Knight PvP at level 80, from the beta. Siege Vehicles! ’nuff said. I haven’t started a DK yet. Yeah, I know, I’m bad. I did play one for awhile in the beta and I’m looking forward to it, but I think I’m going to get my Rogue up to 80, first. I haven’t had much time to play recently and I’m only level 73. So. DKs and PvP. What do you think of them as they stand, now? Are they the overall destruction machine of choice? Or strong against casters and Ok against others? Or…? Are they the Gankers or the Gankees? For the one or two of you (like me) who haven’t started your Death Knight yet and want a leg up, the free leveling guide to the DK starter area is still up. Death Knights, the heavy metal (plate) wearing Hero Class of [tag-tec]Wrath of the Lich King[/tag-tec], are probably going to be the most played class once people load Wrath onto their systems. As it stands, their ability trees are blood, frost, and unholy. They generate runic power and use it to power their big smash attacks. Blizzard sees them as tanks for caster mobs, which brings about interesting PvP thoughts, but they’re solid in the DPS department and should be a blast to solo. Talents? Builds? Powers? Well… All their talents and abilities are still being run through the beta grinder and will be buffed, nerfed, and kicked around until Bliz is happy enough with their status. Since they’re getting a lot of attention from the Devs I assume that the “happy enough” state will actually occur. If you’re one of the few whole will actually be playing one of these death machines then you might want to check ouit some of the “How the [tag-del]Death Knight[/tag-del] Stands Right Now” posts below. Keep in mind that there will be changes between now and the Wrath release date. Here’s a free Death Knight prep guide. (Look for the button in the middle of the red text.) It’s not a talent or leveling guide, rather it gives info on recommended gear as you level to 70, as well as a number of other tips. You can also pre-order the full Death Knight guide from the same page. I’ve heard rumors, here and there, that one or two people are planning on playing a Death Knight when Wrath of the Lich King arrives. Update, 10/31 – The free DK Prep Guide guide is no longer available, sorry. That was out of my control.Â However, there is another freebie, below. As for he prep guide It’s been incorporated into the full Death Knight Guide, by the Killer Guides team. In addition to the prep guide, you get info on talents, builds, strategies, leveling, gold, PvP, and everything else you need to be the most brutal Death Knight that you can be. Check out that guide here, and then check out their screaming deal, 20 WoW guides for the price of 3. The freebie is a leveling guide for the Death Knight starter area (covering levels 55-58.) For those of you have have played several DKs through that area (in the beta) well, you won’t find this interesting. For the rest of you who want a step by step walkthough of all the quests, where to go, what to do, etc., you’ll want this guide. It’ll save you a lot of time getting through the new area. Click here to get yours. Just in case this is true you might want to check out this freebie, the Death Knight Prep Guide. It’s not a leveling or skill guide. It is a guide to potions, gear, and a few other things you’ll want to do to get your Death Knight 100% ready to go for Outlands and Northrend. Buy them and store them now, while they’re cheap.